@RahulJangam: I think that is a realistic estimation. Certainly for the start of the year it will be about how much the others have caught up with Mercedes, not about how much further ahead they are. My attendance at a GP this year is dependent on louder engines! Any updates on this? @Marty: You'll be disappointed I fear. Now Button gets out on track for the first lap of the day in the McLaren. So we've now seen all eight cars here in Jerez on track. @V8Unleashed: I think we can expect a stronger day today. Honest question to everyone....who REALLY likes the sounds of the new V6 Turbos? I appreciate the technical achievements but really miss the amazing sound of the V8's. I really wish I could have heard the V10's and V12's of the last 10-20 years. This engine noise argument is tiresome. It's like avoiding bullet trains because you don't have the chug chug of steam. Accept it, it's better. You can always tell old F1 fans - they are the ones that say "what?" when you ask a question. I will ALWAYS love F1 no matter what engine sound but I think it is missing a little something. You will NEVER hear quiet Top Fuel Dragsters who can do flat 4sec quarter miles! I stepped out of the Singapore subway 2013 and the sound sent chills down my spine and made the hairs on my arms stand up, but that said I appreciate the other sounds from turbos, gear changes and exhausts. Personally dont really care about the noise, just want to see good competition. Loud boring race is still boring. Kvyat and Ericsson are the only two drivers on track at the moment. I honestly prefer the new sound, watched a good few races at silverstone and really found them sore on the ears, went to Abu Dhabi last year it was great! Noise is noise. I want the drivers to race as hard as they can from lights out to the checkers. Get rid of the stupid fuel flow rules and let them them race as hard as they can the entire race. what's the word with Kimi and Hamilton? Ferrari only one lap and no time, Merc 5 laps and no time? @DuncanSant: Neither is unusual for a test day. Mercedes have been going to the end of the pit lane and Hamilton has been revving the car hard while stationary before doing a practice start. It sounds a bit like they are trying to break it, which probably isn't far from the truth. A lot of testing is about finding weak points before the first race. Because he has been coming straight back into the pits on every lap he has not set a time. Kvyat hasn't come back to the pits so it appears the Red Bull has stopped somewhere on track. I've just been up on the media centre roof and it looks like the Red Bull is in the gravel at Turn 8. It's too far away to see if there is any damage. A recovery truck has been dispatched to bring the RB11 back. Hi Lawrence... given the new nose designs, which team do you think has undergone the most drastic change in design philosophy? And is the Ferrari really up to mark or its just Testing!! 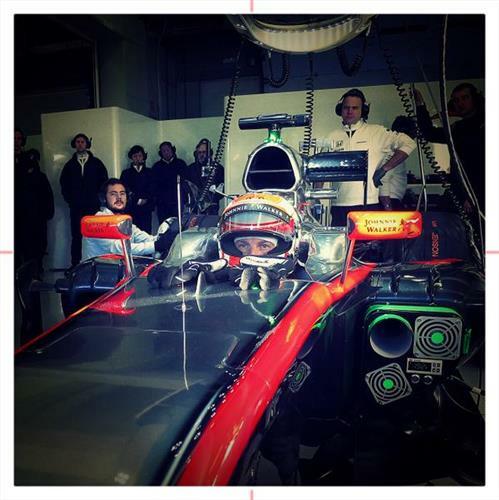 @kaustav: I would say the McLaren is the most drastic change overall, but possibly not the most impressive nose. Talking to a few people, that award appears to have gone to Red Bull and Mercedes for their super-short efforts. The Red Bull one was apparently particularly tricky to crash test and they had some back up ideas in case it failed. Oh dear.. let's hope he hasn't broken another front wing... not starting well for Kvyat. My mistake, that's actually Turn 9 where he has found the gravel. Turn 9 is the same corner Felipe Nasr spun off yesterday morning when it was damp. It's in the shade down there so possibly a bit more slippery than elsewhere on the circuit. Maybe he should cange his name to Graviil Kvyat? Saw a couple shots on Sky of the McLaren going through one of the chicanes, it looked like a real handful. PU troubles aside, what's the word on the chassis? @mfbull: Actually McLaren are pretty happy. I haven't seen it in the slow stuff but Alonso pushed a couple of times into Turn 1 and the team reported back that it was sticking quite nicely. The slow speed corners are less dependent on aero and more about power delivery and driveability - considering getting the engine started was an achievement yesterday, there is probably plenty of smoothing of the power and torque curves to be done before Melbourne. The chassis and aero, however, is not providing to many nasty surprises at this early stage. I just wish the engines had more HP, the cars had bigger tires, and they freed up the aero restrictions. I hate the feeling that my nephew could drive one of these cars better than I could. can Mclaren really afford to wait? @barkun: I suppose Kvyat's little off is proof that you are better off in the garage than in the gravel. But it does seem a bit odd. I like the new engine sound. So much more to hear now. Different engine noises, squealing tyres and the crowds. Just just the monotone scream of the V8 (which wasn't a patch on the old Ford DFV anyway). has there been rain again overnight? @kaustav: A little bit, yes. It's still damp out there but the good news is that the sun is out and drying the track. The green light is back on. Verstappen is quick to head back out and now he's been joined by Ericsson. Do the youngsters spin so much because they haven't learned to (or can't) catch the car or is it just youthful exuberance in tricky conditions? @mfbull: Very hard to say, but at this stage of the pre-season you can't rule out a car issue - or lumpy torque delivery or braking instability. Kvyat looked like he lost it under braking and went straight on into the gravel. He didn't look close to the barriers at the end of the gravel trap, so hopefully it wasn't too bad. Maybe they should bring some GP2 teams along to go bombing around the track to dry it. No wait, too many crashes.